What National Group Is Funding the Pro-Common Core Lawsuit in Louisiana? A Re-post from Dr. Mercedes Schneider's blog wherein she offers up a peek at a chapter in her new book, A Chronicle of Echoes. Anyone who honestly wants to know about the exploitation of public education needs to read this book, soon to be followed by Dr. Schneider's newest book on Common Core State Standards. I would add here a few notes - Choice Foundation is sparring with KIPP Schools for placement at an RSD school in New Orleans. Both were evidently promised that site over the last several years of juggling and under three Recovery School District Superintendents, Paul Vallas, John White and now Patrick Dobard. They both appeared at the RSD BESE meeting Wednesday night in a show of "friendly" competition but asking for yet another "final" decision to be made. I noted in my testimony that night that it will be interesting to see if this decision will be influenced by the fact that Choice Foundation is a plaintiff in the lawsuit against Gov. Bobby Jindal to which BESE has enjoined! If, in fact, Choice Foundation is "rewarded" with the school, will we see yet another lawsuit by KIPP? The group footing the bill for this lawsuit is a well-funded, national “choice” group known as the Black Alliance for Educational Options (BAEO). In my July 22, 2014, post on the issue, I mention that I wrote about BAEO in my book, A Chronicle of Echoes, an encyclopedic whistle blower on the exploitation of public education. 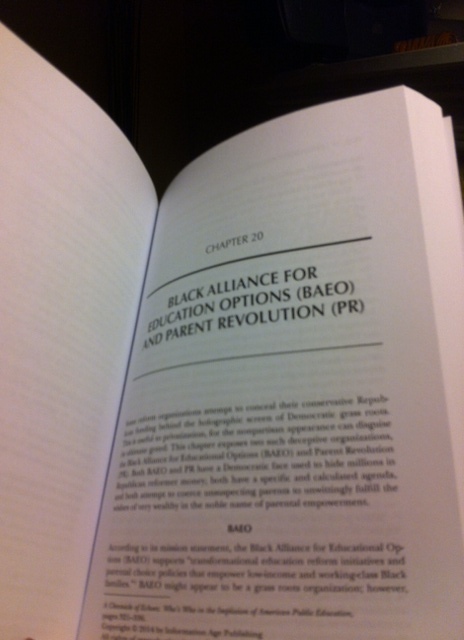 In Chronicle of Echoes, BAEO shares a chapter with another “pro-choice” group, Parent Revolution. For those who are considering buying my book– and for those who just would like to know more about the not-so-grass-roots organization that loves charters and vouchers and is ponying up the cash in order to keep CCSS in Louisiana– I would like to offer this opportunity for you to read my chapter on BAEO/Parent Revolution. BAEO is the group fronting the money for the pro-CCSS Louisiana lawsuit, but go ahead and read also about Parent Revolution. The experience will be an eye-opener. Then, once your eyes are opened by way of this single chapter, you might wish to purchase the book (kindle version available here) and read the remaining 23 chapters.